History seems to be repeating itself as just like the Xbox 360 version, the PC and PS3 versions of the Lara Croft and the Guardian of Light have had their online multiplayer options cut. 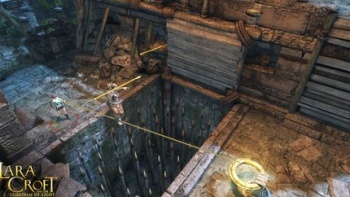 Much like their Xbox 360 counterparts, anyone who grabs the new Lara Croft game on PS3 or PC later this month and wants to indulge in some co-operative tomb raiding action had better have his or her buddy in the room. In a press release put out to promote the game's launch on the PS3 and PC, Crystal Dynamics revealed that online co-op would be coming to the PC and PS3 versions of the Lara Croft at some unspecified, "later date." The Xbox 360 version was supposed to be getting the feature patched back in on the same day as the multiplatform release, but whether that's still the case isn't clear. When the delay was announced last month, Crystal Dynamics' head of franchise development Karl Stewart said that the studio didn't want online co-op to be the weak link in the chain, and presumably this is the case with the PC and PS3 versions as well. It's hard to say what affect this will have on sales, but it's almost certainly not going to be positive.